Stackable, storage box is strong, dependable, portable and stackable. Heavy-duty, triple-end, double-side, double-bottom construction stacks up stronger and withstands frequent handling. Stacking weight is 850 lb. Reinforced tear-resistant hand holes make box comfortable to carry. Deep, locking liftoff lid stays in place for secure file storage for letter-size or legal-size files. Smooth rolled edges add strength and prevent paper cuts. Easy FastFold One Step Setup saves assembly time. 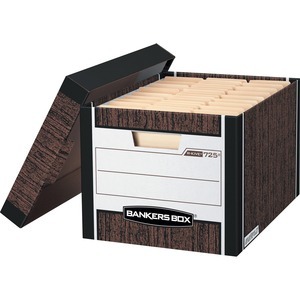 Box is built for heavy daily usage and maximum stackability. Ideal for stacking without shelving. Storage box contains a high percentage of recycled material. 10" x 15" Sheet Size - 5 1/4" Expansion - Redrope - Redrope - Recycled - 10 / Box"